Ever since Annabel was very little, pictures of Madeline have caught her eye. At first, it started with her staring at photos with her serious baby gaze. As she grew older, she would smile at her sister, then laugh. Laughing moved to pointing with excited babbling, and then she started saying “bay-bay” when we passed a picture of Maddie. Annie knows how to push the button on my iPhone that make the screen saver light up. The picture is of Maddie. Annie has started kissing my phone. She notices everything these days. If I’m wearing earrings, she points at them. She’ll tug on my necklace, reach for my glasses. Not long ago she discovered my tattoo. She pokes it with her chubby fingers, as if checking to see if it will rub off. She’ll look up at me and exclaim in baby talk. Yesterday she grabbed my wrist and flipped it over. She poked at my tattoo and said, “Mah-dah.” Then she bent over and kissed my wrist. Maddie, this is Annie. She loves you very much. Me four. What a sweet girl you have. She will learn so much about Maddie and be so proud to have her as her big sister. So sad and so sweet at the same time! Hugs to all of you today and always. Smiling through the tears. Thank you for sharing. This is so touching and brought tears to my eyes. I’m so glad Annie is starting to understand the presence of her older sister. I have goose bumps imagining her saying that. How beautiful. Your girls are so beautiful and you raise them both with so much love. Thank you for helping me seeing the beauty and love in the world through the story of your life. The bond that sisters share is a powerful one. They will never meet, but Annie will always love her sister, and I know Maddie will always love her too. You just made me cry. You have beautiful girls. You should be very proud. Heather, this post is just so beautiful. It caught me offguard, leaving me crying the big crys. I know that you miss her every day. I read your posts on all different topics … but your love and ache for her is always a constant. A priceless story. A breath-taking post. **Crying** – SO NOT FAIR- MADDIE SHOULD BE HERE!! Of course she’ll grow up loving Maddie b/c she will see and feel how much you & Mike love Maddie. She will see how you look at her pictures, your expression while you watch her videos and the love in your eyes when you talk about her sister. Annie will grow up knowing Maddie thru you & loving her with you. I know you wish it were different….we all do. OMG – you have NO idea how much I wish that for you. For what it’s worth…I think you’re doing such a great job introducing your 2 daughters and nuturing the love one little girl will always have for her big sister!! Oh yes, tears over here too. Such a sweet post. There really is something so special about when our living babies show their love for their siblings who have gone. I love that my kids all want to have a picture of Emma in their rooms. I love that Libby carries around a picture of Emma and says, “That’s my Emma”. And just like that, they know their sister and they love her and they remember her like only a sibling can. OMG, that is amazing! And awesome! And so sweet!! I just got chills and all kinds of teary and I’m at work!!! oh – so so sweet. how dare you make me tear up so early in the morning! Tears here too. What a special moment. Thanks for sharing. Aren’t sisters amazing? Love that transcends everything. So, so sweet! Thank you for sharing! Your girls are beautiful! This post brought tears to my eyes. Annie is such a sweetie. She really does love her big sister so much. That is just so sweet it made me cry. What a beautiful moment. Bring on the waterworks! How sweet it must have been to hear Annie speak Maddie’s name. this is really beautiful! thank you for sharing with us! Heart tug….teary in a sweet way. I don’t have any siblings but I can say that I truly believe that bond obviously transcends space and time. Oh. This gave me chills. So much love between your two girls, Heather. I can’t even imagine what that would have felt like. Tears. How incredible. Made my heart smile. I read everyday, and sometimes you catch me off guard, leaving me crying in my car. Love to all of you. So many things to say, but the one that comes most persistently to mind is that you are a good, good mom. I am crying here…what a beautiful post. You are an amazing parent, Heather. And you have amazing daughters. So beautiful. It made me cry. I only wish she was kissing Maddies cheek instead. I still have her picture on my blog and I always will. Oh boy. Way to make me cry at work! Wow! That made me cry. How beautiful, touching and sweet! I’m with all of the other teary eyed readers, here. Such a touching post and image. Love to you all. I love this. 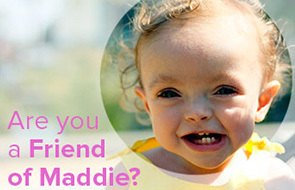 It’s so great that you make a point to share Maddie with Annie every day. I know it had to make your heart melt when you heard Annie say Maddie’s name for the first time. That is made of win. Plus a few tears on my end… but all in all, one of the most wonderful things I have ever read. UGH!!! LOVE that!!! Sweetest thing ever!! I got teary-eyed. I love this. Thank you for sharing. *crying* so precious!! Love them both so so much! This went straight to my heart. I’m a little teary now. Sweet Annie, sweet Maddie. Oh my goodness, that is beautiful. I do hope that made you smile, cause it makes me smile. Annie will know her sister, that is for sure. What a beautiful little sweet baby kiss that was. I am reading this on my lunch break, and I couldn’t even swallow because my throat closed up with emotion. So much joy! Truly moving and beautiful. Love never dies. This 67 year old dude who coached baseball for 25 years just teared up. Precious, beautiful, bittersweet. Thanks for this. Not that we didn’t already know this, but you make some sweet girls. It’s amazing and wonderful that your sweet girls already share a connection. *tears* Sending you hugs, of course. And just like that I’m crying in my cube at work. What a beautiful post. A – – M – – A – – Z – – I – – N – – G!!!!!! Oh – sweet babies! What a beautiful moment. tears rolling down my face for this one…what a beautiful moment! LOVE both of your girls! This made cry. Looking through the comments, I am find I am far from alone. What a beautiful moment. Thanks for sharing. I know that Maddie will be such an important part of Annie’s life. Where was the mascara warning on this one? Such a beautiful moment. Thank you for sharing it with us. Okay Heather, you just made my heart go all blubbery. I can only imagine how your heart must have filled up. Sobbing. How beautifully touching and so very sweet. There are no words to express how special that moment was/is. WOW!! Such a beautiful moment. You brought tears to my eyes. One of the most beautiful posts I have ever read! This post made my heart break and mend at the same time. Maddie lives on in your love…and Annie’s love….I cannot think of anything more beautiful than her lasting legacy. Okay, looking up at the ceiling to try and get the tears to go back inside of my eyeballs. Thank you for sharing one of life’s more gut wrenching and beautiful moments. Heather, I have been reading your blog for a while now and I have found so many of your posts moving and beautiful but especially this one. Your little girls will always share a bond that nothing can break and thank you for sharing this story and your beautiful girls with us. Beautiful. in the midst of tears. That is precious beyond words. And now you have a beautiful written narrative of it, for Annie to hopefully read one day and smile over. How fantabulously cool! Those are the most beautiful, or since I used fantabulously, I might as well use beautifulest!! two syllables a little sister could ever put together! Awesome, Annie!!! Your two girls should be there with you, together. I’m so sorry that they’re not. Annie is so sweet and smart. Beautiful post – thank you for sharing. Take care. That is the sweetest thing I have heard in such a long time. The love shared between siblings is so strong and transcends EVERYTHING. You are doing an amazing job of letting Annie know Maddie and letting her feel the love you and Mike have for both of your girls. Good job Mom and Dad! oh, wow. how achingly lovely. This one made me tear this morning. So sad and beautiful. That sound Steve Martin makes in Father of the Bride when the daughter calls, I love you, Mattie! to her little brother on the night before her wedding? I just had one of those. *Sob* – so beautiful. Annie and Maddie have such a special bond. Thank you for sharing these moments with us, Heather. Sitting here with tears in my eyes. Blessings to you Maddie and Annie. Sweet, sweet sisters. She loves you ALL very much. Ah, the tears. Your babies have made their way into my heart. I love your daughters. That is the most beautiful story, Heather. Annabel is such a healer! So AWESOME and BEAUTIFUL! I LOVE IT!! Sending kisses to those girls of yours!!! Amazing. They are both loved very much and they are so lucky for it. I just want to get in my car right now and drive to you and hug you all. So beautiful and at the same time, heartbreaking. I’m crying too. Isn’t it heartwarming when our young children inherently understand the love of family? That bond transcends all else. Annie knows Maddie loves her. And she loves Maddie too. Seriously this is the sweetest thing I have ever heard. After reading this, I was inspired to draw… Beautiful girls you have. Your family is such an inspiration. Such a beautiful post Heather, your ability to write your heart out on a page is a gift, for you and for all of us who read your words daily. Incredible, I felt like I was there when Annie turned your wrist over and said her sisters name, a more beautiful sound I cannot imagine. Forever sisters. i love that you are telling annie all about maddie. i think it’s so important to keep those memories and her spirit alive. i will be interested to hear how their relationship develops, because it is something i think about everyday with my living son. i want him to know all about his brothers, but i also don’t want to confuse him. how do you explain death to someone who still spits his food out? how do i explain to him that he has three older brothers, but he just can’t play with them. i remember reading about a woman who had twin girls, only one of which survived. the surviving twin was questioned by a teacher at school because she kept talking about her sister, and the teacher didn’t know that she really did have one. she thought that it was an imaginary friend. what do you do with that situation??? i would never want someone to tell my son that he doesn’t have any siblings…that would devastate me, and also confuse the hell out of him if i keep telling him about his brothers. very tough questions….like i said, i look forward to hearing how annie and maddie’s relationship develops. in the meantime, i love that annie seems to feel a connection to her sister. And now I’m crying. So very sweet! Melts my heart and brings tears to my eyes! Overwhelming beautiful and heartbreaking at the same time. Sending so so much love. and she loves you, heather very much too. Oh that took my breath away. Excuse while I burst into tears. oooh, you made me cry again. Such wonderful daughters. I know this is supposed to make me sad but for some reason, it doesn’t. My heart fluttered. It feels like they finally met. What a beautiful moment. I know it must be bittersweet but it’s just another sign that they will always have each other and no matter where your family members may be, you will always be part of the same family and share the same love. I read your post and all the comments and I agree with them all. Just beautiful! But like the comment above me… I feel like they met, I can’t imagine how you felt to hear Annie say Maddie’s name. Nothing can come between the bond of sisters…. even if they never physically met. I can’t help but think that was Maddie telling YOU she loves you very much…through Annie. Oh this makes me cry, but how incredible that she is so switched on to who her sister is. I love that she is already trying to say her name. Thank you for sharing this. This made me shed a tear. Also to hear Annabel say, “Mah-dah” must have been heavenly music to your ears. And I’m sure no matter how old Annie gets, or how many new words she learns that, “that will be your favorite.” Of how she first said her sister’s name, when she was just a babe.